A former head of a Hells Angels chapter accused of attacking a man outside a pub told a court he left with his wife when trouble flared. Matthew Barnes said: "I was concerned about my wife, about getting her home." 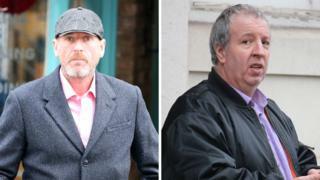 Mr Barnes, 48, from Hastings, and Oliver Wilkinson, 50, of St Leonards, both deny causing Christopher Harrison grievous bodily harm with intent. The Old Bailey has heard Mr Harrison's eyeballs were ruptured in an attack at the Carlisle pub in Hastings in 2016. He was targeted because he did not want to join the Sussex Hells Angels motorcycle club, the court was told. Mr Barnes, a former president of the Sussex chapter, told his barrister Paul Evans he had never even met Mr Harrison. He said he had left the pub at about midnight as he wanted to get his wife, who was seven months pregnant, home. "I heard there had been a fight. There was a situation," Mr Barnes said. His barrister asked him: "You were in a biker pub [and] heard there had been a situation. "You are the president of the Hell's Angels... Did you not want to find out what was going on?" Mr Barnes replied: "I wasn't interested in what happened. As a husband I was concerned about my wife, about getting her home." Mr Harrison has claimed Mr Barnes, of Victoria Avenue, Hastings, head-butted him and Mr Wilkinson, of Duke Road, St Leonards, punched him.